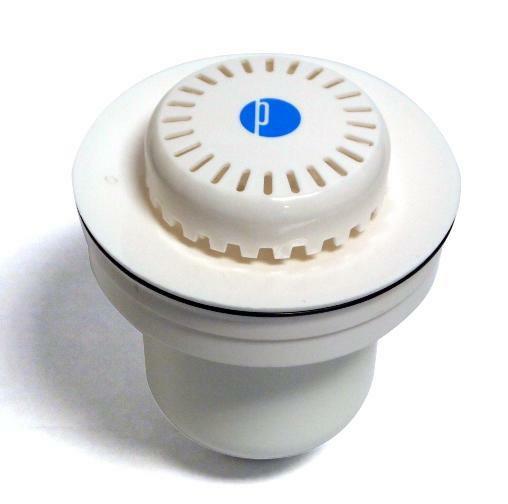 Drain Insert is made of 100% recyclable ABS plastic; Odor Barrier Liquid is 100% natural and biodegradable. 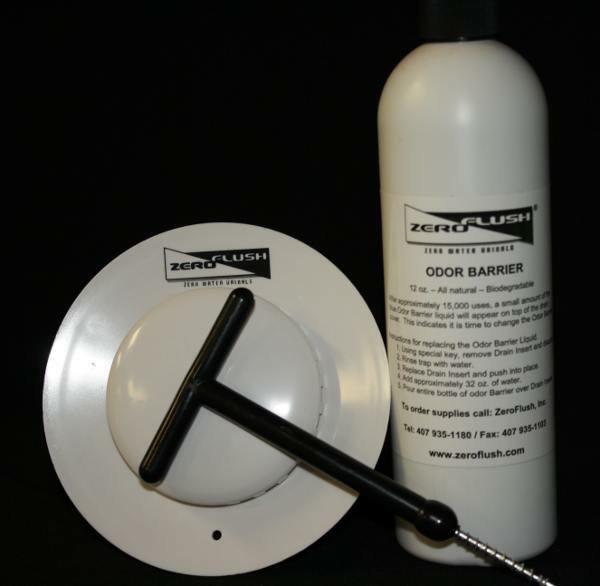 Odor Barrier lasts for up to 18,000 uses before replacement is necessary. View trap insert replacement instructions and Odor Barrier Liquid MSDS. Notice: On 1 February 2012, ZeroFlush introduced a new line of advanced EnviroSeal™ Urinal Cartridge Systems. These include the 2002-W Elastomer Seal Dry Cartridge Kit and 2001-W J-Trap Dry Cartridge Kit. Both of the new cartridges are engineered to last an estimated 6 months. Standard oil-based cartridges (ZF-KIT) are still available for those customers who wish to continue using them. This item qualifies for FREE DELIVERY to any destination in the continental USA. Canadian orders for ZeroFlush™ products are always welcome. Use our simple currency converter (below right) to calculate your price in Canadian dollars. Canadian customers are instructed to call or email our office to receive a shipping quote. How It Works: The concept is simple. Human male urine is approximately 96% water. The question is: “why use water to move water”? 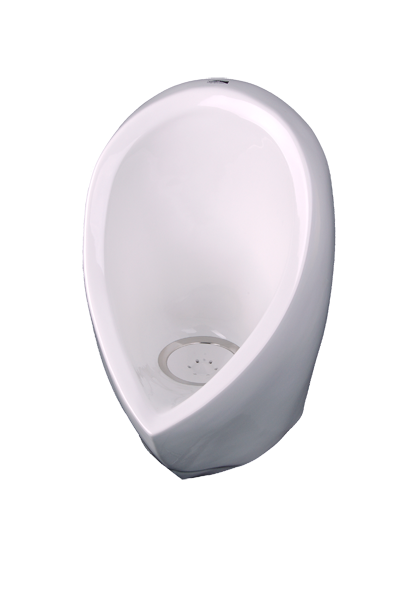 The ZeroFlush® urinal trap utilizes a time tested, proven method and technology to move urine into the waste system and eliminate urinal odors. The housing has a removable and replaceable “drain insert” that, when in place creates a very effective vertical S Trap system. Maintenance: After approximately 18,000 uses simple routine maintenance should be performed. Maintenance consists of replacing the drain insert and giving the system a quick water rinse. Frequency obviously depends upon how heavily the urinals are used. Remove the drain insert with the tool provided. You’ll notice the remaining odor barrier fluid and any urine inside the waste trap will automatically flush away down the waste pipe. Rinse the waste line with a bucket of water. Install new drain insert into the housing. 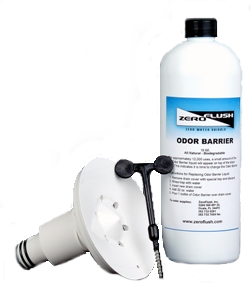 Pour in all-in-one ZeroFlush® Odor Barrier fluid through the drain insert and the urinal is ready for use. At no time will the person replacing the odor barrier fluid come in contact with urine.